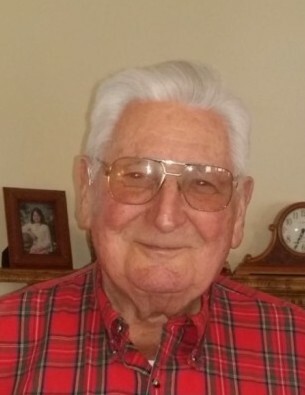 Leslie Horace Woodall, age 90, died Tuesday evening at his home. Born in Johnston County, he was the son of the late Leslie Junious Woodall and the late Jeannette Mozingo Woodall, husband of the late Ruby E. Woodall and father of the late Janet W. Davis. Horace was retired from McLamb Monument Company and was a member of Selah Christian Church. A service to celebrate Horace’s life will be held Friday at 7:00 pm at Shumate-Faulk Funeral Home with Rev. Patrick Muston officiating. Family members will greet friends immediately following the service at the funeral home. A committal service will be held Saturday at 11:00 am at Falling Creek Baptist Church Cemetery. Horace is survived by two sons, Jerry Woodall and fiancée, Lacey, Jeff Woodall and wife, Pat; a brother, Aubrey Woodall; a sister, Joyce House; seven grandchildren and twelve great grandchildren. Flowers are welcome or memorial contributions may be made to Selah Christian Church, 1332 Selah Church Road, Four Oaks, NC 27524. Shumate-Faulk Funeral Home and Crematory is serving the Woodall family and online condolences may be sent to www.shumate-faulk.com.